Is Kim Jong Un Preparing to Become North Korea's Economic Reformer? Talking about "the affluence of socialism" in today's North Korea is, of course, ludicrous. The economy "Lil' Kim" inherited from his father is a disaster. Marcus Noland, the deputy director of the Peterson Institute for International Economics in Washington, D.C., and a close North Korea watcher, estimates that per capita income today is "lower than it was 20 years ago and by some reckonings is only now attaining the level it achieved in the 1970s." He further notes that since a disastrous currency reform three years ago, inflation for basic goods like rice and coal has been running at about 100%, and on the black market, the North Korean currency has fallen by about the same amount. Aping his father's economic policies, in other words, would be about the stupidest thing Kim could do. If this story is accurate  TIME has been unable to verify the authenticity of the documents the Mainichi Shimbun obtained  the implications are important for obvious reasons. It may mean that the young Kim, who spent a few years as a teenager going to school in Switzerland, may be willing to acknowledge the blindingly obvious: that what North Korea has been doing for decades economically doesn't work, and that there are plenty of examples right in the neighborhood  South Korea and China most obviously  that over the same period have gotten a lot of things right economically. Kim's father, Kim Jong Il, visited China numerous times during his life, and each time journalists would write stories about how the visit surely meant that North Korea would now embark on China-style economic reform. But policy analysts in the region as well as former diplomats and intelligence officials say that the late Kim never trusted the Chinese and did not want to implement policies that would effectively allow North Korea to become an economic appendage to Beijing. If the sentiment and frustration expressed in the Mainichi Shimbun report are real, it may well be that Kim Jong Un is willing to accede to reality: China is the world's second largest economy and it sits right across the border; increased trade with it as a result of reform policies in Pyongyang would likely enhance living standards in North Korea. Even in Kim Jong Il's last years, North Korea had taken baby steps toward setting up the sort of special economic zones that kicked off China's growth more than 30 years ago. Pyongyang has been involved in negotiations with Chinese investors on three separate locations, including building a new container port in Rason, in North Korea's northeastern corner. China earlier this year had rejected a draft law to be applied to the other two special economic zones in which it is interested in investing, apparently worried about, among other things, the remittance of profits. Analysts believe Kim Jong Un could send a signal that he's not nearly as paranoid as his father about China by getting these deals done. There have been hints here and there that the younger Kim may be much more willing to experiment economically  hints that suggest that the sentiments expressed in the Mainichi Shimbun documents could be authentic. In an interview in Pyongyang with the Associated Press on Jan. 16, Yang Hyong Sop, vice president of the Presidium of the Supreme People's Assembly, said, "Kim Jong Un is focusing on building a knowledge-based economy and looking into cases of other countries' economic reform, including China's." 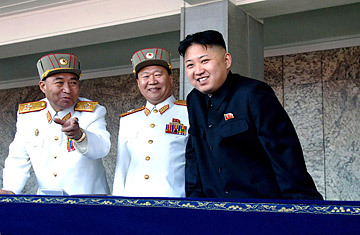 North Korea watcher Cheong Seong-chang, senior fellow at Seoul's Sejong Institute, says that remark was notable because senior officials in North Korea tend not to speak speculatively about possible policy changes; they only speak publicly, and in particular to the outside world, about things that are already decided. That, if true, would be a hopeful sign that, however much he's following his father's footsteps on military and foreign policy, the young Kim may understand that he's got to break with the past in order to make good on his no-more-belt-tightening pledge to the abjectly poor North Korean people.